It can be easy to overlook the fact that, even though the wilderness is beautiful and majestic, it’s also rugged and potentially hazardous if you fail to employ common sense or caution now and then. Because of this, there have been careless individuals over the years who find themselves in sticky situations. One such situation occurs when an individual stumbles across a rattlesnake and in an ill-conceived attempt to protect the snake or hikers, tries to move it away from the trail, which can result in a bite. Here’s what to do if this (knock on wood) ever happens to you or someone you know while you’re on the trail. If you or someone with you has been bitten, you’ll want to move away from the snake and inspect the wound for the symptoms listed above. Be sure to call 911 immediately and notify them of your location and situation. If you’re close to a road, get there as soon as possible and wait for emergency care. If there are several of you, carry the victim. If you’re far from the nearest road, as in several hours away, walk calmly to the nearest road after calling 911, taking turns carrying the individual if you have enough people with you. Too much distance between you and the road might require you to have the bitten person relax and remain calm where you are in order to conserve energy and strength, if the bite isn’t too severe. It’s not uncommon for a rattlesnake to deliver a dry bite, in which no venom is injected, which can happen if a snake has just injected venom into prey or is merely surprised and wasn’t trying to deliver venom with a bite. Each bite should be taken seriously, though, and if bitten, you’ll first want to check for two bite marks on the skin. If you find a bite, clean it thoroughly with soap and clean water. You’ll be able to tell if venom has been delivered a number of ways, including the following: a large amount of pain at the bite site, redness or swelling, blisters, and bruising after a few hours. The more severe these symptoms are, the more venom has been injected. Forget all the so-called “remedies” you’ve heard over the years—sucking the venom out, for example—and instead, focus on the fact that the most important thing about snake bites is how fast the bitten individual gets to a hospital. 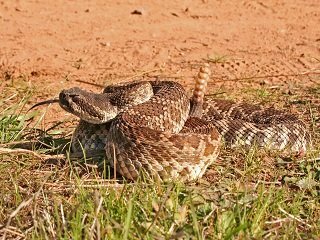 Rattlesnakes, as well as the other vipers found in the United States, possess venom that damages the tissue around the bite area, so any folk remedy would really do more damage than good. DO NOT use a tourniquet, as this cuts off blood flow to the tissue and will allow the venom to do more damage. Also, don’t try to catch or kill the snake, as this can lead to further bites, the needless killing of an innocent animal, and wastes time. Really, the main cause of snake bites is people trying to catch or kill the snake, or carelessly putting their hands or feet somewhere without looking. The situation is scary and I won’t lie, it is serious, but the most important thing to do is contact emergency services, get to a main road if you can, and remain calm. Panicking isn’t going to fix it and it certainly isn’t going to get help faster. If you find yourself in rattlesnake country this year, be sure to keep your eyes open and if you hear a rattle, mind your footing and keep moving. Snakes don’t want to bite, but they will if provoked; don’t give them a reason to bite.